Greece has been hit harder by the financial crisis than any other EU member state, with the economic fallout threatening to undermine the country’s democratic system. 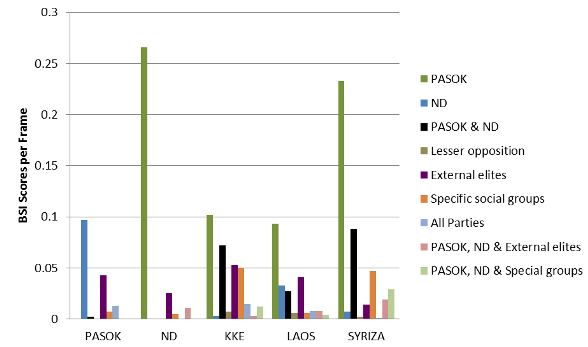 Based on an analysis of political speeches, Sofia Vasilopoulou, Daphne Halikiopoulou and Theofanis Exadaktylos assess the response to the crisis by the five parliamentary parties in Greece between 2009 and 2011. They find that populist rhetoric and blame-shifting has been a key component in the responses of all five parties. The global financial crisis has significantly impacted on European economies. In comparison to other Eurozone countries facing similar external financial pressures, such as Ireland, Portugal and Spain, Greece has presented the most problematic case, having been often described as the ‘sick man of Europe’. Why is Greece Europe’s weakest link? The Greek predicament may not be fully understood without a reference to Greece’s endemic problems. This is, essentially, the paradox of sustaining a democratic institutional system, while not progressing beyond the deeply embedded clientelistic and rent-seeking networks that permeate Greek political culture. The coexistence of these contradictory systemic features during the post-dictatorship era has facilitated the establishment of what Takis Pappas describes as a ‘populist’ democratic system. This system allowed Greece to develop politically and economically during periods of international financial stability, but at the same time rendered the country unable to withstand external shocks. Our work takes this argument further, by testing the ‘populist’ democratic system theory through the use of a sophisticated framing analysis of speeches delivered by the leaders of the five parties in parliament during the 2009–11 period. More specifically, if the theory is correct and populism is a defining feature of the Greek political system, then it is likely to be expressed through the narratives of Greek political actors. The question that derives from this initial hypothesis is how this may manifest itself during times of crisis. If populism is the main justification upon which the system rests, and crisis opens up political opportunities for smaller actors in the system, then we may expect that a populist master narrative is likely to be observed across the party system. In other words, populism is likely to be widespread across the political spectrum and is independent of party ideology. In order to measure this, the next logical step is to unpack the concept of ‘populism’ itself. Given that the term may be understood as a fundamental dichotomy between the ‘blameless us’ and the ‘evil others’, then we expect that populist rhetoric is likely to be expressed in the forms of blame-shifting and exclusivity. Finally, we need to consider whether populism is monolithic or whether its expression involves variation. Given that Greece has an adversarial and clientelistic political system, and that access to political power has tended to imply varied access to rents, then we may expect that the rhetoric of blame-shifting populism is likely to differ depending on the position in the party system, between the mainstream parties that do have access to rents and the fringe parties that do not. To test these hypotheses we proceeded with content analysis through which we constructed two indexes. The first is the blame-shifting index (BSI), which measures the extent to which party leaders’ rhetoric was populist. This is a simple calculation of party leader negative references to the above categories within each speech, weighed against the mean length of all speeches by each party leader. The second indicator is an exclusivity index (EI) constructed per frame, which calculates the proportion of the difference between positive and negative references over the total references. This index shows the intensity of exclusivity vis-à-vis other groups. Our empirical testing yielded overall confirming results. Chart 1 below illustrates that parliamentary debates across the party system were characterised by a severe penetration of populist frames. All five party leaders engaged in a practice of populist blame-shifting, albeit to varying extents and in different forms. As expected, mainstream blame-shifting, employed by the two major parties, is a more concentrated form of populism. Blame is directed against fewer actors, concentrating upon the major contenders in the system: that is, each other as the two main parties competing for government, and external elites. Fringe blame-shifting, employed by the smaller parties, is a less concentrated form of populism entailing that blame is spread out, and directed against a wider range of actors including the party of government, the party of opposition, external elites, specific interest groups and the collaboration between them. Note: Each bar represents the extent to which a party directed blame at the targets shown in the key on the right-hand side. This is measured on the blame-shifting index (BSI) shown in the vertical axis. The main Greek parties are the Panhellenic Socialist Movement (PASOK), New Democracy (ND), the Communist Party of Greece (KKE), the Popular Orthodox Rally (LAOS), and the Coalition of the Radical Left (SYRIZA). In Chart 2 below we combine the mean BSI and EI scores according to party ideological positions. Blame-shifting is visualised in terms of the size of the bubbles: the bigger the bubble, the greater the extent of blame-shifting in party leader speeches. The position on the vertical axis represents each party leader’s mean EI scores. 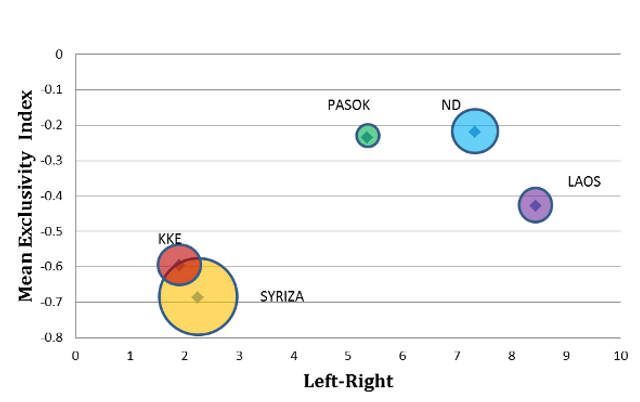 We placed the five parties on the horizontal left–right axis based on an expert survey of Greek political parties that took place in 2011. Note: The size of the bubble indicates the extent to which each party engaged in blame-shifting (a larger bubble indicates more blame-shifting). The left-right scale shows the party’s position (with a score of 0 being extreme-left and 10 being extreme-right). The Exclusivity index shows how negative or positive speeches were overall (a negative value shows a party articulated more negative statements than positive ones). Overall, the findings from the mean BSI and EI scores show that both mainstream and fringe party leaders engaged in an iterative blame-shifting game, revealing their common willingness to divert political accountability. In this way, they shifted the focus from a specific debate over what type of reform was needed in order to successfully manage the crisis, to who was to blame for the crisis. The crisis presented Greek party leaders with a catch-22 situation. On the one hand, these actors were subjected to substantial international pressures for implementing reform, but on the other hand, structural reform would inevitably lead them to compromise their position within the political system. Essentially, the need to provide successful solutions to what is primarily an economic problem with international dimensions, presented Greek actors with a political dilemma: how to implement fast and effective structural change, while not compromising their own position in the status quo. The answer: by diverting political accountability through populist blame-shifting rhetoric. Given the development of a populist democracy in the post-dictatorhsip era, this is unsurprising and the most likely option available to Greek political actors. The full article will appear in the Journal of Common Market Studies, Issue 52, Volume 2 in March and is available for an early view here. Theofanis Exadaktylos is Lecturer in European Politics at the School of Politics, University of Surrey. His research areas include the Europeanization of the foreign and public policies of member states, the EU financial crisis’ impact on political trust and populism and EU institutional design. He is also Research Associate of the Hellenic Observatory at the London School of Economics.